English 19th-century white vellum; lettered: Horae Beatae Mariae Virginis; in gray-brown slip case. Arthur Chichester, first Marquess of Donegall (1739-1799; biographical sketch in pencil on last leaf); Richard Bennett (bought Aug. 17, 1895), his bookplate, his Catalogue, no. 47; purchased by J. Pierpont Morgan (1837-1913) with the Bennett Collection in 1902; J.P. Morgan (1867-1943). 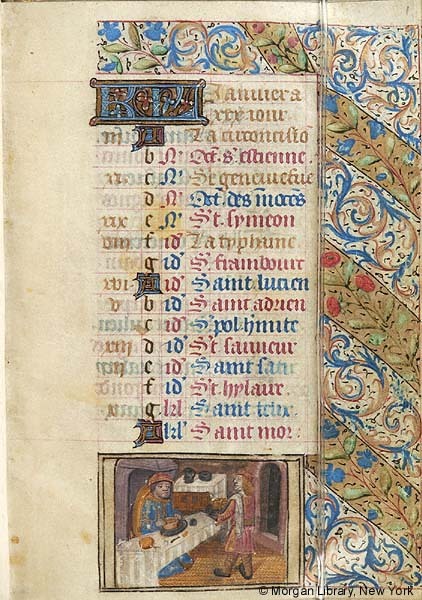 Ms. book of hours for the use of Paris (Hours of the Virgin); written and illuminated in Paris, France, between 1485 and 1500. Decoration: 5 full-page, 10 large, and 13 small miniautures; 24 calendar vignettes. Artist: Chief Associate of the Maître François.